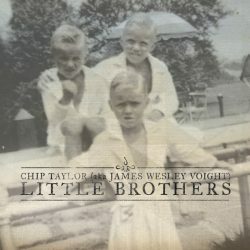 As a veter an of the music scene for the last sixty years or so, Chip Taylor has earned the right to make what could be considered an indulgent album telling stories from his life and family. It sounds like it could have been made as conversation flows and reminicences come forth following a long and well lubricated dinner party with relaxed and easy storytelling coming from a voice that sounds honeyed and velvety and which delivers the spoken and sung word with charm and wit. This is not an album to get the blood racing and it needs a few listens to “get”, but it is a generous piece with all the right sentiments. The opening track “Barry and Buffalo” is about golf, not a subject matter that you hear in song everyday. It tells the story of Taylor’s brother who takes his daughter to a tournament that she goes on to win and of the respect that the game demands and teaches others. “Enlighten Yourself” needs little explanation and “Refugee Children” is a song about Taylor’s experiences of watching such children play in a camp when touring Sweeden last year which is introduced with a long narrative in the preceding track. The production, musicianship and overall backing vocals are exemplary and there is much emotion especially with the touching song for Taylor’s wife, “St Joan”. However, this is very much a niche record and the indulgent tone will not appeal to all.